Vic Sadot “Truth Troubadour” CD Celebration in Berkeley Set 1 (39:28) Redwood Gardens Community Room Event 6-10-17. Published June 14, 2017 at “Vic Sadot” YouTube Channel. 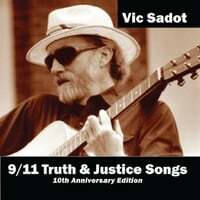 Vic Sadot “Truth Troubadour” CD Celebration in Berkeley Set 2 (31:45) Redwood Gardens Community Room Event 6-10-17. Published June 14, 2017 at Vic Sadot YouTube Channel. The Set #2 Songs were mostly French language songs with some English translation lyrics by Vic Sadot sung as French-English bi-lingual songs. (1) Changes was written by the late-great American folk singer, Phil Ochs. Poetic and philosophical, it’s a great song for reflection. (2) The Fog Watch was a poem by George Reuter. My poet father considered it a visionary masterpiece. Later I took on the task of setting it to music. I first played it with the Crazy Planet Band at a Newark Community Day show. Drummer Rob BoxTurtleBob added a cowbell on to his perfect oxen-driven wagon pace. I still hear that in my head when I play it solo. (3) Fayette County Snow by Greg DeCowsky. Song #5 of 18 on the “Truth Troubadour” CD. (4) The Spirit of the Trees by Vic Sadot. This song was inspired by the defense of East Bay forests from logging and pesticides, and performed live for the first time, at Redwood Gardens Community Room in Berkeley, California, August 28, 2016. (5) Billboard Bandit by Vic Sadot & Greg DeCowsky. This song came out of hearing an actual news story about a resident of Los Vegas who got fed up with the ever-expanding visual pollution by billboards. (6) When I’m Gone by Phil Ochs. Like Changes, this Phil Ochs song is beautiful as poetry and philosophy. (8) Full Spectrum Dominance by Vic Sadot. Since the end of the so-called “Cold War” the goal of the US military has been global hegemony or total control of land, sea, air, media, and cyberspace. The 9/11 & Anthrax Attacks of 2001 only put that effort into overdrive in combination with destabilization of the Middle East neighbors to enable Israeli expansion and hegemony there. In effect, the policy of “Full Spectrum Dominance makes us all the enemy” as evidenced by NSA spying on every person whether suspected of a crime or not, the “legal” violation of the 4th Amendment of the Constitution of the United States stating “the right of the people to be secure in their property and houses”. (8) I Ain’t Got No Home by Woody Guthrie was the closer song for the evening. Thanks to all who helped on the event team to make the event so enjoyable! Next Post How to UNITE FOR OUR RIGHTS!